IMBUS of peripheral veins can achieve faster diagnoses, reduced cost, and improved patient satisfaction, but only with detailed knowledge of venous anatomy and good experience with the technique. Clinic patients suspected of PE enter an urgent diagnostic pathway because early therapy is needed for this disease. A normal d-dimer (dD) lowers the chance of PE to a very small percentage in patients with a low pre-test probability, but because dD isn’t immediately available in clinic, even these patients usually receive CT PE with its radiation, IV contrast, inconvenience, and expense. Multi-organ IMBUS (heart, lungs, and veins) can improve the speed and accuracy of diagnosis (Nazerian et al. Chest, Oct. 2013) and avoid a substantial number of CT PE studies. Cardiac IMBUS detects clinically important right heart dysfunction with a sensitivity equivalent to formal cardiac ultrasound and this finding shifts a patient to an emergent admission path. A CT PE may still be needed in such patients unless a major venous clot is also seen and then the patient might be treated immediately upon admission. Cardiac IMBUS could find another reason for a patient’s presentation, such as heart failure, and then the CT PE study would not be needed. Lung IMBUS can find alternative diagnoses such as consolidation pneumonia, large pleural effusion, or diffuse interstitial edema. The 2013 report noted that patients with PE can have localized, modest-sized, wedge-shaped, sub pleural consolidations, most commonly in the posterior and inferior lungs. This finding has a high positive likelihood ratio for PE, but sub-pleural consolidation can be seen in infectious and metastatic disease, so a patient’s other clinical factors are important for diagnostic reasoning. Venous IMBUS can find deep venous thrombosis (DVT) in a leg or arm vein. If IMBUS of the right heart is normal in such a patient, a CT PE is not needed and outpatient anticoagulation with an immediately acting oral anticoagulant can be started. Most information about IMBUS for outpatient DVT comes from emergency department studies, where well trained physicians have been equivalent to, or slightly worse, than formal leg ultrasound (US). Most series show that ≤ 20% of outpatients suspected of DVT actually have the disease. Expert IMBUS of the leg veins requires knowledge and experience, particularly regarding anatomy, patient positioning, use of the probe, and Doppler techniques. The advanced IMBUS physician recognizes a suboptimal exam and obtains formal leg US. IMBUS of the leg veins augments the dD assay. Without IMBUS, the clinic physician’s first option is to send all patients for immediate formal ultrasound while waiting for the dD to come back later. This option is wasteful of formal US. The other option is to send all patients home while waiting for the dD result. If the dD returns positive, a formal ultrasound is performed the next day, but this strategy runs a risk that a patient with a DVT is sent home without immediate treatment. IMBUS in the clinic at least ensures that hemodynamically important proximal leg clots won’t be missed as a patient goes home to await the dD result. Estimate the prior probability of DVT (perhaps using the online DVT diagnostic calculator), do IMBUS, and order a dD for almost all patients. The following diagram approximates the diagnostic integration, but always consider whether over or under-diagnosis is a worse error for any particular patient. A patient with low pre-test probability of DVT (e.g. ≤10%) and a good-quality, normal IMBUS exam has a post-test probability of ≤ 2% and a later-returning normal dD further reduces the chance to <<1%. A moderate pre-test probability patient with a normal IMBUS study definitely needs a normal dD to get to <1% probability of DVT. 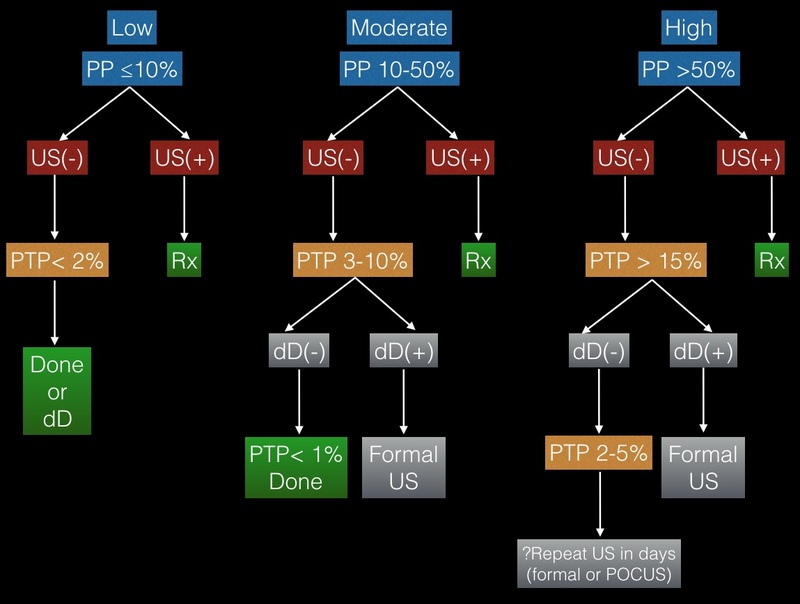 If the dD instead returns elevated, the patient needs a formal US the next day but the risk of a major PE during the night is minimal. High pre-test probability patients with normal IMBUS and normal dD have post-test probabilities of DVT that are still worrisome for some patients (2-5%) and might need repeat IMBUS in a handful of days to be sure that visible DVT has not developed. Positive IMBUS leg vein exams should result in immediate oral outpatient anticoagulation. Distal calf veins (veins below the second bifurcation in the popliteal region) are difficult to visualize and there is uncertainty about treating clots in these veins. Such clots don’t cause major pulmonary emboli, but can extend more proximally in a minority of patients. These patients should return immediately to clinic if they have persisting or worsening symptoms and some higher risk patients should be scheduled for a repeat IMBUS exam within a week to look for extension of clot. Bilateral leg IMBUS is unnecessary when symptoms and signs are clearly unilateral. However, if an equivocal abnormality is seen on a symptomatic side, comparison to the same area on the contralateral side is helpful. Left leg DVT is more common than right because of several anatomic factors (beyond the uncommon May-Thurner syndrome) and popliteal region thrombosis is more common than femoral region, although the proximal leg clots are more dangerous. The leg anatomy diagrams in this chapter are of the right side, but the US images are from the more commonly thrombosed left leg. Although the veins flow towards the heart, the leg exam is performed from proximal to distal so we are referring to the venous branches and bifurcations analogous to the arteries. Here is a simplified venous anatomy diagram for a brief overview of the exam. The exam starts at the inguinal ligament with the common femoral vein (CFV), proceeds through the branching of the saphenous vein (SaphV), and then the further branching of the CFV into the deep femoral vein (DFV) and the femoral vein (FV). The FV is lost about half way down the medial thigh as it runs deep behind muscles. The main deep vein is seen again at the posterior knee as the FV becomes the popliteal vein (PopV) and this is followed through two branchings. 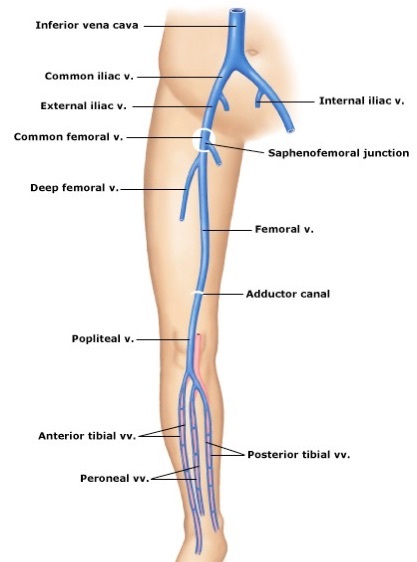 The blind spots are the iliac vein above the CFV and the portion of the FV between the mid thigh and the PopV. We partly deal with these two areas with color flow Doppler (CF) and pulse wave Doppler (PW) as described a little later. Most DVTs involve multiple sections of veins by the time the patient presents clinically. However, the following diagram shows the location of isolated DVTs in one reasonably large study. 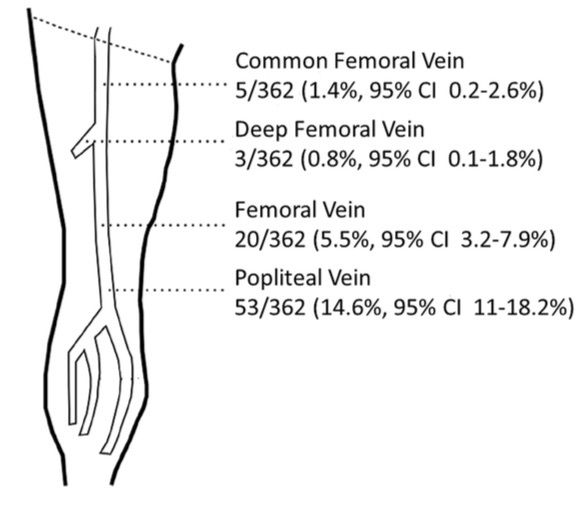 The PopV was the most common site for an isolated DVT while the DFV was the most unusual, which is fortunate because it is more difficult to image. Patient positioning: Although standard patient positioning for leg vein US has been supine, a comparison of the exam in the standing and the supine positions convinced us that the standing position will be the standard clinic approach. Here are the factors that influenced this decision, as well as circumstances that cause reversion to a supine exam. If possible, the prone position is probably better for the popliteal exam if the standing position has trouble showing collapsibility. 1. The veins are more distended and usually easier to see in the standing position for both the femoral and popliteal regions. 2. The linear probe is often mechanically easier to use on the popliteal area with a posterior approach in the standing position. 3. For many patients, it is easier and quicker to lower their pants to the floor and have them stand against the exam table than to remove pants, get on the table, and get positioned. For the standing position, the examiner sits on a rolling chair and lowers the ultrasound cart to its lowest position. 4. Although it can take somewhat greater pressure with the probe to collapse veins in the standing position, most patients do not find this painful. If the pressure is too uncomfortable, revert to the supine/prone exam and hope the vein visualization will still be adequate. 5. PWD of the CFV and PopV still shows respirophasic flow in the standing position, but if this is absent or equivocal in both legs in the standing position, repeat PWD in the supine/prone position to confirm. 6. Patients who cannot stand must obviously be examined supine/prone. There isn’t a good solution for wheelchair patients who can’t be moved to the exam table. The popliteal region and part of the femoral region can probably be seen in these patients, but the CFV is compromised. 7. Obese patients may have fat hanging down over the inguinal area in the standing position. Draping and protecting the underwear with a washcloth sling usually holds up this adipose layer. The physician creates the sling and the patient (or helper) holds it up as shown in the following picture. Probe, Depth, and Gain: The linear probe optimized for a venous exam is used with the indicator examiner left in both legs. In obese, muscular, or edematous patients decreasing the frequency (RES to GEN or GEN to PEN) may get more interpretable images. The literature discusses using the curvilinear probe (ABD exam type) for large legs but formal US should probably be obtained in these patients unless distinct thrombosis of the CFV, FV, or PopV is seen. 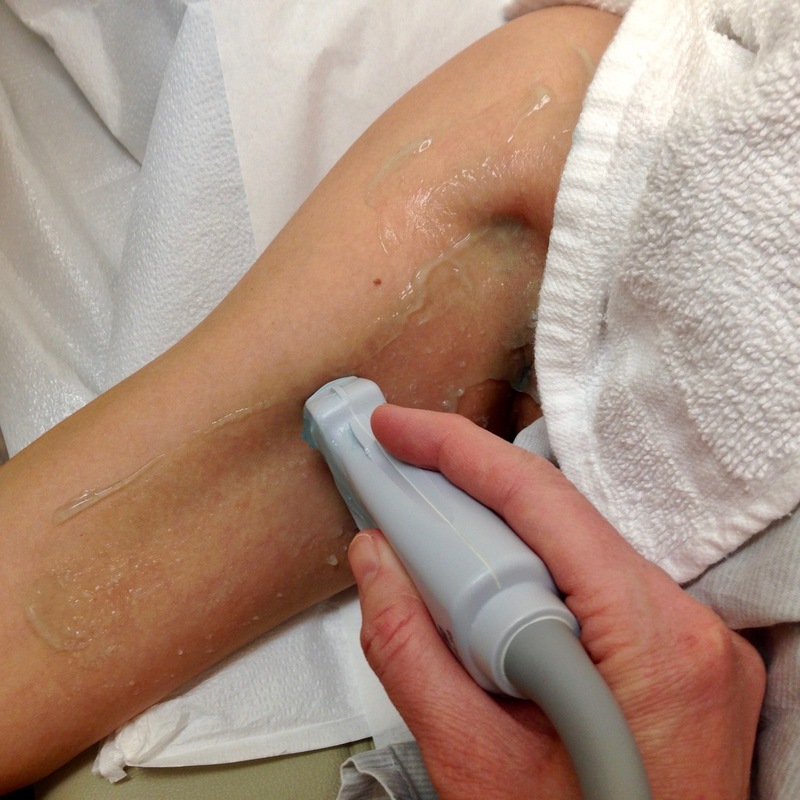 Pressure on the probe can reduce the distance between the probe and the veins, creating clearer images, but this pressure may also start to collapse the veins. Optimize the gain so the vessel blood is mostly anechoic but there should still be distinct margins and some detail in surrounding tissue. Be sure to also optimize the image at the start using depth, focus position, and magnification. Gel: The probe infrequently needs to be protected with a glove for the femoral region. Whether the examiner wears gloves is personal taste, but is also not required in most patients. The probe will cover a large area in the femoral region, so it makes sense to pre-apply some gel to avoid leaving the leg to get more gel. A good estimate can be made about the path of the femoral vein from the medial inguinal ligament to the medial mid thigh and a gel stripe placed over this path. The PopV gel is applied when the patient has turned around for the lower leg exam. Compression: The primary criterion for a DVT is “lack of complete compressibility” of a vein. The probe needs to be perpendicular to the vessel to optimize compression. The amount of pressure needed is dependent on the amount and character of overlying tissue. In general, pressure is not complete until there is beginning deformation of the accompanying artery. Slow, gradually increasing pressure with two hands may be needed to keep the vein centered and having patients braced against the exam table stabilizes them for this pressure. Here is an example of a well positioned and magnified left CFV in a lean patient that showed full compression with progressive pressure that just started to deform the common femoral artery (CFA). The clip was stopped just before the walls of the CFV “kissed”, which is what should be seen if the vein is normal. Color flow Doppler (CF): CF can help to identify vessels, distinguish arteries from veins, separate blood vessels from other hypoechoic structures, and detect phasic flow with respiration. CF can also help identify veins that are partly occluded. Adjust the CF sector size and gain at the beginning of the leg exam using the CFV and the CFA. There is often little CF signal in the veins with a perpendicular, transverse probe because venous flow velocity is slow. Here is a PopV that showed a rim of color flow around a mostly occluding clot. The vein was non-compressible. Augmentation: When a vein is hard to visualize with CF, the calf can be squeezed with the hope of seeing an increase in CF signal if the vein is patent. However, lack of augmentation is not a reliable marker of thrombosis. Visible thrombus: With correct gain, a venous clot may show increased echogenicity with B-mode imaging. It is difficult to use the clot appearance to differentiate between acute and chronic thrombosis, although acute thrombosis usually enlarges a vein and recanalization seen with CF strongly favors chronic disease. The following clip shows both hyperechoic material in a PopV and partial venous color flow around it. Stasis or slow flow in a vein can appear as spontaneous echo contrast, but if the vein fully compresses, there is no clot at that location. Here is an example of spontaneous echo contrast in a CFV that collapsed fully, but the flow progressed cephalad poorly because of thrombus in the iliac vein above. This CFV also did not have respiratory variation in Doppler flow, which is discussed below. Transverse and Longitudinal views: Most literature describes looking for DVT with a transverse view, which is better for assessing compressibility. However, a longitudinal view will sometimes clarify the anatomy or confirm an abnormality, particularly at the more difficult DFV/FV branching and the two branchings of the PopV. CF venous flow may only be seen in a longitudinal view with an angled sector box. The patient should turn the foot outward on the leg to be examined to expose the medial thigh. Begin as cephalad as possible at the midpoint of the inguinal ligament and look for the CFV and CFA. 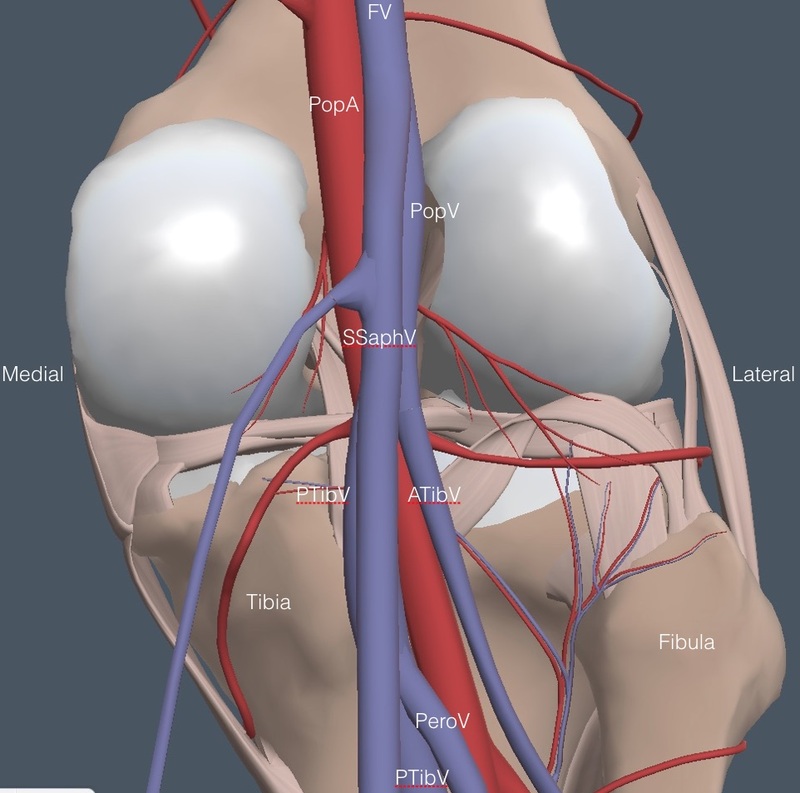 Here is a detailed anatomy diagram of the veins in the right femoral region. Notice the two branch points. The most difficult exam area is where the DFV and FV branch. Next, for reference during the rest of this femoral region discussion, the arteries and some green elipsoids representing lymph nodes are added. A comparably named artery accompanies each vein, except for the SaphV. The CFV is always medial to the CFA near the inguinal ligament as seen in the following clip from the left leg. The vessels are clear, nicely centered, and probably just large enough without magnification. CF: Apply CF to the CFA and CFV and optimize the sector size and gain. Here is a typical normal appearance in the left leg with little signal in the CFV. The CF gain could have been turned up a bit based on the CFA appearance, but there would still have been minimal signal in the CFV. Respirophasic flow: The longitudinal orientation is usually needed to assess flow velocity variation with respiration. First, use CF with an angled sector to see if good flow variation is seen with deep breathing. If it is, PW isn’t needed. If CF variation is uncertain, activate PW and align the cursor parallel to flow in the middle of the CFV. Once the PW signal is activated and scrolling, adjust the scale so enough signal is visible. The patient then takes a deep breath in and out. Below is normal CFV respirophasic flow. The sweep speed needs to be slow enough to encompass a respiratory cycle. If the iliac vein or IVC above the CFV is blocked, PW will show a monotonous line that doesn’t change with deep respiration, as in the following image. In these patients, flow in the CFV may be very weak even with the most sensitive (lowest) scale setting. In some patients with lack of CFV respirophasic flow, it is possible to visualize the iliac vein in the low pelvis by moving up above the inguinal ligament, finding the iliac vein, and applying CF and PW in long axis. Compression: The next step is showing complete compression of the CFV as in the next clip from a left leg. Notice the vessels were magnified and gradual pressure was used to keep the vein centered. Next is a patient with an acute thrombosis of the left CFV. The vein is larger than normal and does not compress well despite definite collapse of the CFA. There may be some hyperechoic material in the vein. When this appearance is seen, do not compress deeply or repeatedly for fear of detaching the thrombus and causing a PE, although this is a rare event. Saphenofemoral junction: Repeatedly compress the CFV every cm during a caudad slide with the probe until the saphenofemoral junction is seen on the medial side. Compress the CFV and the SaphV completely, as in the next clip from a left leg. Apply CD if something looks unusual. Here is an enlarged, thrombosed left saphenofemoral junction with echogenic material in the lumen, no CF signal, and no compressibility. While the SaphV is a superficial vein, it is large and thrombosis in this vein can extend into the CFV. Thus, proximal SaphV thrombosis is usually treated like a DVT. The SaphV can be followed down the medial thigh if a patient has superficial symptoms in that location. 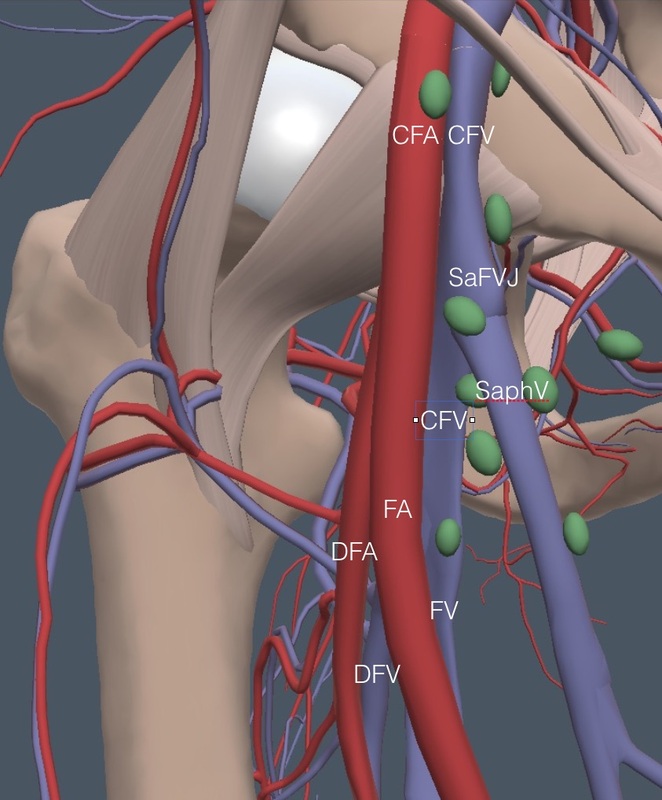 A little caudad from the saphenofemoral junction the CFA bifurcates into a more anterior femoral artery (FA) and a more posterior and lateral deep femoral artery (DFA). Shortly caudad of this arterial bifurcation the CFV then bifurcates into a larger and more anteromedial FV and a smaller posterior and lateral DFV. 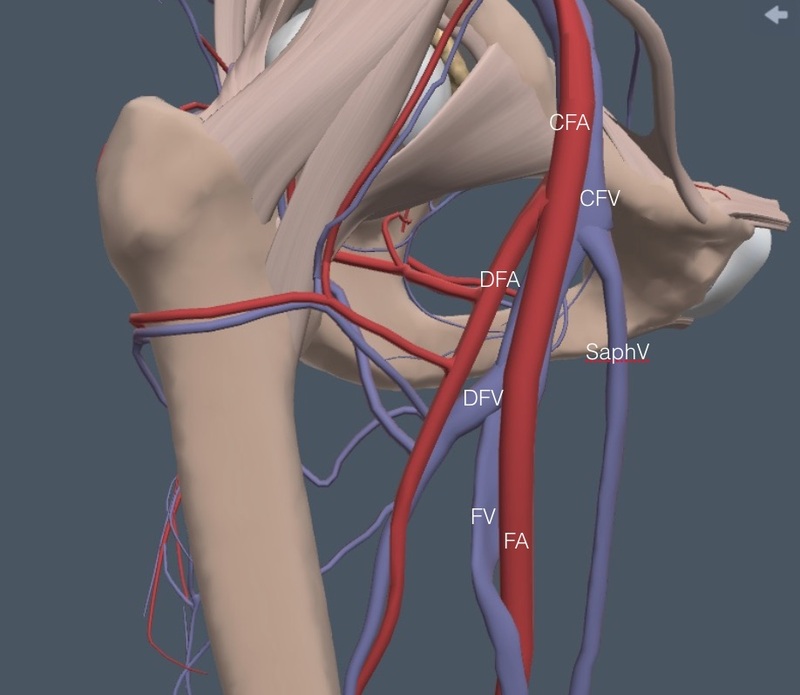 Here is a lateral view of the anatomy that shows the DFV and DFA running posterior from the FV and FA. The next clip shows a typical appearance in the left leg (with CF) as the CFA bifurcates with the FA anterior to the DFA. The CFV remains single and medial to both arteries and fully compresses in this clip. The following clip shows the initial DFV branching lateral before it runs posterior. The venous compression leaves only the FA and DFA visible. Here is another patient showing the DFV/FV branching and its normal compression. If the DFV is indistinct in the transverse view, switch to a longitudinal view to be sure of the branch location. The DFV branches posterior to the FV. Compression can be used, but care is needed to be sure that the probe is not just sliding off the vein. Here is the longitudinal view of the previous patient. A little further caudad and sometimes the FA, FV, DFA, and DFV may all be seen in cross section, as in the following clip. The FA is the most anterior vessel and immediately below it is the FV. The DFV is about the same size and immediately below the FV in this patient, but the DFA is smaller and just to the lateral side of the DFV. The two arteries became clear as both veins were fully compressed. The DFA and the DFV disappear posteriorly from view as the probe slides caudad and the remaining FV is followed and compressed into the adductor canal until it disappears or can’t be compressed because of muscle tissue. Here is a clip showing full compression of the FV as caudad as it could be compressed. It may take a lot of pressure to compress the vein in this location and a firm two handed grip may be needed to prevent sliding out of position. The patient turns around and stands with his back to the examiner, bracing against the exam table. Gel is applied to the popliteal area and the probe is placed at the top of the popliteal fossa in the midline, with the indicator examiner left for both legs. Sometimes the examiner’s left hand must be on the front of the knee to brace it against the probe pressure. Below is the anatomy of the region for the right leg. The vein closest to the probe is the superficial short saphenous vein (SSaphV), which is partly obscuring the PopV in the diagram. Thrombosis can occur in this vein and it can be examined if a patient has superficial symptoms. 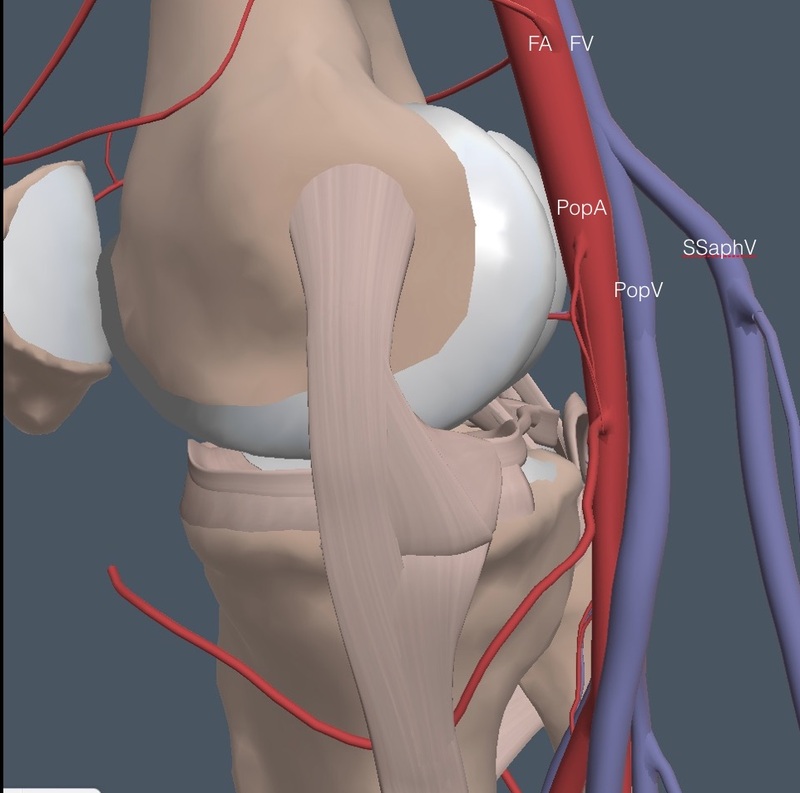 Here is the anatomy from a lateral view showing the superficial location of the SSaphV. This vein collapses easily with light probe pressure so it is often not seen. Start at 6 cm depth and use CF if necessary to spot the PopV and popliteal artery (PopA). Next is a clip showing the SSaphV at the top of the screen with the PopV below and on top of the PopA where it lies in almost all patients. Compression was applied at the end of the clip and the SSaph and PopV both compressed, although the clip was stopped just before the PopV was completely compressed. Notice the several smaller collapsing veins just anterior to the larger PopV. These are smaller deep, muscular veins that come off the PopV in this high location and when they are seen, we want to see them collapse, even if we don’t name them. However, thrombosis isolated to these smaller veins does not usually warrant anticoagulation, but repeat study for progression might be needed. Here is another patient with full compression of a PopV. CF/PW is applied to the long axis cephalad PopV to show intact respirophasic flow, inferring that the FV in the adductor canal is at least partly patent. The next clip shows an acute thrombus in a popliteal vein. The PopV is large, the superficial and small muscular veins compress, but the PopV never collapses completely. Slide the probe slowly caudad on the PopV, repeatedly compressing, until a first bifurcation. Here is a view of the anatomy with the SSaphV removed. The smaller anterior tibial vein (ATibV) moves off lateral, leaving the larger tibioperoneal vein (TibPeroV) to continue into the calf. Here is a clip of a normal first branching of the PopV in the left leg, showing complete collapse of all veins with compression. The indicator on the screen represents the lateral side of the left leg. Again, notice the additional small vein lateral to the PopV and a medium size vein anterior and medial to the PopV. These muscular veins can thrombose. All veins in a field should collapse. 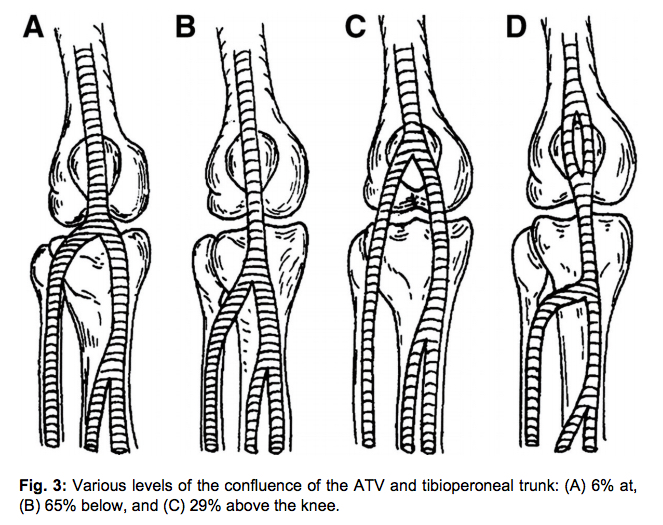 There is some variation in where the ATibV branches, as in the following diagram drawn from the front of the right knee. Wherever it branches, the ATibV always goes off lateral and disappears. Fortunately, the ATibV rarely has isolated thrombosis so missing this vein is of minimal clinical consequence. Here is another patient with an easily seen ATibV separating from the TibPeroV with both veins easily compressible. Slide the probe further caudad, compressing the TibPeroV until a second branch point where the usually larger posterior tibial vein (PTibV) stays medial and the smaller, peroneal vein (PeroV) runs off lateral. Sometimes this branch point is too caudad to see well and sometimes there is duplication of a vein. 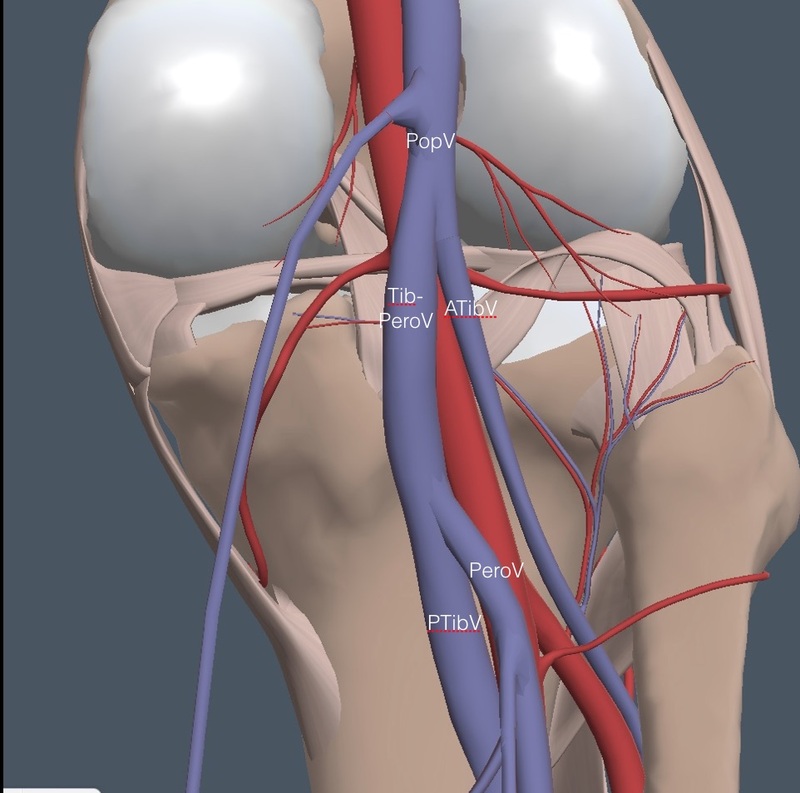 Here is a just-distinguishable branch point in a left leg, with the more anterior vein hinting at running off laterally being the PeroV while the larger, more posterior vein is the PTibV. Compression obliterates both veins, leaving only the PopA. The PeroV usually disappears quickly and only the larger PTibV is followed and compressed as far caudad as possible. Here is another patient with particularly prominent branching of the TibPeroV. In fact, there are three or four branches in this view, all of which fully compress. There may be several PeroV or there may be some additional muscular veins. Clots further caudad than the branching off of the PeroV are the controversial ones in terms of treatment (in addition to the smaller muscular veins). 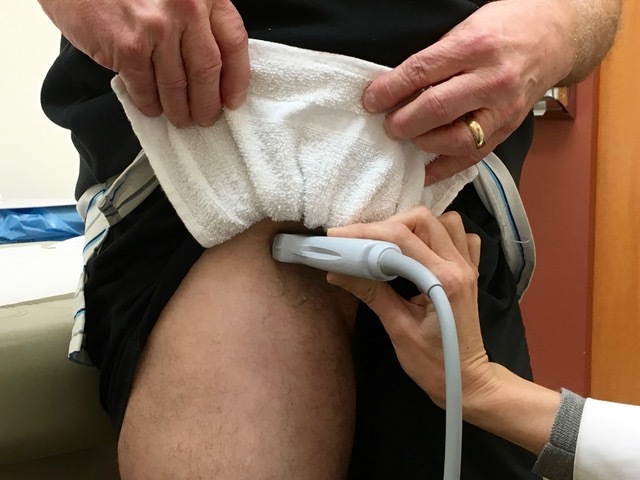 The IMBUS exam, and many formal ultrasound labs, don’t try and pursue the distal PTibV or PeroV, even though they are still considered deep veins. Lymph nodes: Enlarged nodes are an issue for the femoral region. Nodes are superficial to the vessels, but can look like a thrombosed vein in transverse view. Even with CF, an enlarged, distorted node may be hard to differentiate from a thrombosed vein. A longitudinal view should easily show that a node is not a vessel. In addition, with appropriate depth, the CFV and CFA should always be seen as separate and deeper than lymph nodes. Here is an enlarged lymph node in the region of the CFV and CFA. Baker/popliteal cyst: Baker cysts are fluid-filled synovial-lined sacs coming from between the medial head of the gastrocnemius and the semimembranosus tendon about at the joint line. They communicate with the knee joint, but this communication is often difficult to see. Here is a contrast MR arthrogram of a left leg showing a Baker cyst arising from the medial side and spreading to the middle of the leg. These cysts create an apostrophe or comma shaped structure with clear borders, anechoic fluid, and some internal hyperechoic signals. 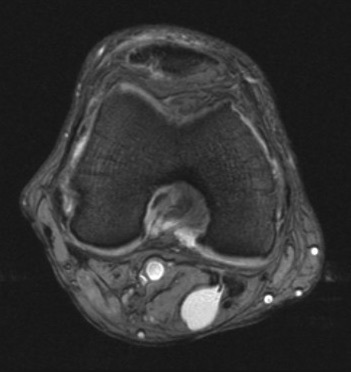 Here is a transverse US view of a medium sized Baker cyst in the left leg. Baker cysts start small but can become large and rupture. These synovial cysts can cause symptoms that mimic a DVT and can even compress the PopV resulting in a DVT. There is no CF signal in a Baker cyst but the cyst will often compress to some extent. A longitudinal view of a Baker cyst will make clear that it is not a vessel. DVT in the upper arm can embolize to the lung, but these clots are rarely large enough to cause hemodynamic decompensation. Repetitive embolization can infrequently lead to chronic pulmonary hypertension. Spontaneous DVT in the arm is rare and requires some narrowing of the subclavian vein because of thoracic outlet syndrome or a condition known as Paget-Schroetter syndrome in which soft tissue between the clavicle and the first rib creates stasis, particularly in patients who repetitively use their arms over their head (e.g. athletes). Here is a diagram of Paget Schroetter syndrome. 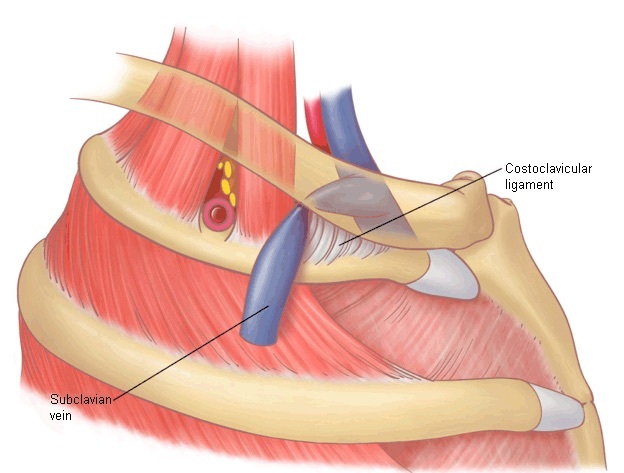 Most DVTs of the arm are postoperative after arm/shoulder surgery or the consequence of indwelling venous catheters in patient’s who are hyper-coaguable. Most proximal arm clots will be anticoagulated, while more distal arm clots require careful balancing of the risk of extension versus the risk of anticoagulant-related bleeding. 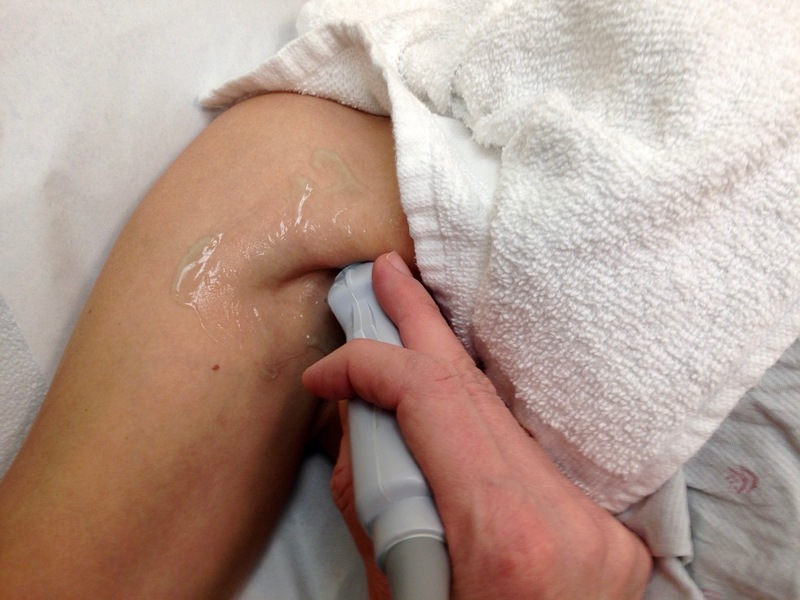 Unless a patient has specific complaints in the lower arm, patients with arm swelling or discomfort usually receive an IMBUS exam above the elbow. The ultrasound appearance of a thrombosed arm vein is the same as a clotted leg vein, so only the sequence and technique will be shown. The first consideration is patient and examiner positioning. The arm veins are better distended when the arm is slightly below heart level, which means the patient should be sitting or semi-upright. The veins should also be in a free flowing position, which means the arm needs to be abducted. These conditions are met in the clinic exam room with the patient sitting on a chair against the exam table with the arm abducted and resting on the table, usually with the thumb up. NOTE: The standard arm vein exam is described and performed from proximal to distal, but a good case can be made that a distal to proximal exam may be more efficient in some patients, particularly those with large arms. 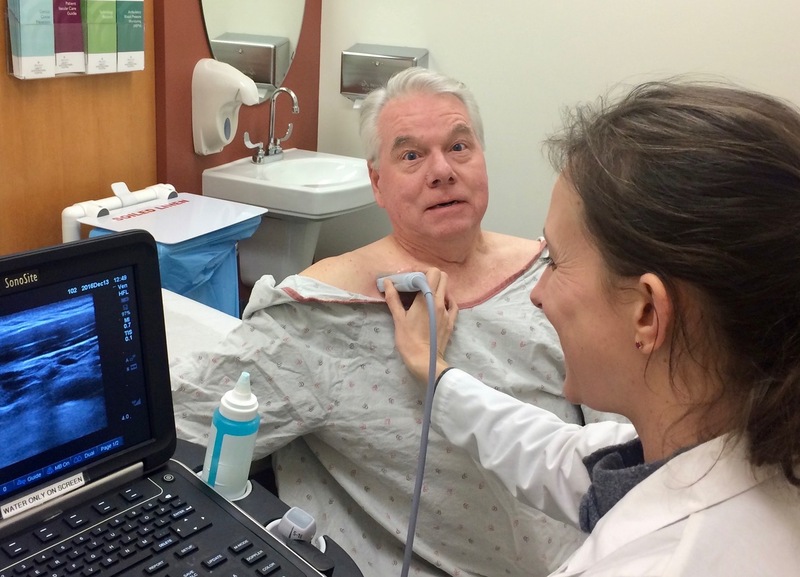 The arm vein exam begins with the internal jugular vein (IJV), which was covered in an earlier chapter. Lack of compression of the IJV is easy to see and CF in the longitudinal view may further define clot. Note the special need to look at the IJV in febrile patients with severe sore throat to identify septic phlebitis of the IJ, which is Lemierre syndrome. After the IJV exam, move to the proximal subclavian vein (ScV) which is directly below the IJ, but also directly behind the clavicle. It is difficult to fan caudad enough to see the ScV from above the clavicle so move below the clavicle. In the patient position picture above, the probe was infraclavicular and was imaging the ScV. The ScV can’t be compressed in this position, but CF can show the vessel fill with signal and have respirophasic variation. Here is normal CF flow in the proximal ScV. Slide along underneath the clavicle toward the axilla, keeping the ScV in view using CF and watching respiratory variation. The ScV then disappears as it goes between the clavicle and the first rib, but it appears again as it runs obliquely from the clavicle toward the axilla. Here is the anatomy of this area with all of the overlying muscles removed. The ScV and the axillary artery can be seen in transverse view as they cross to the axilla and the ScV may compress, but if overlying muscle prevents compression, apply CD in the longitudinal view to evaluate. Here is normal CD flow in the distal, pulsating SCV. At the end of the clip the vein collapses just with a deep inspiration. 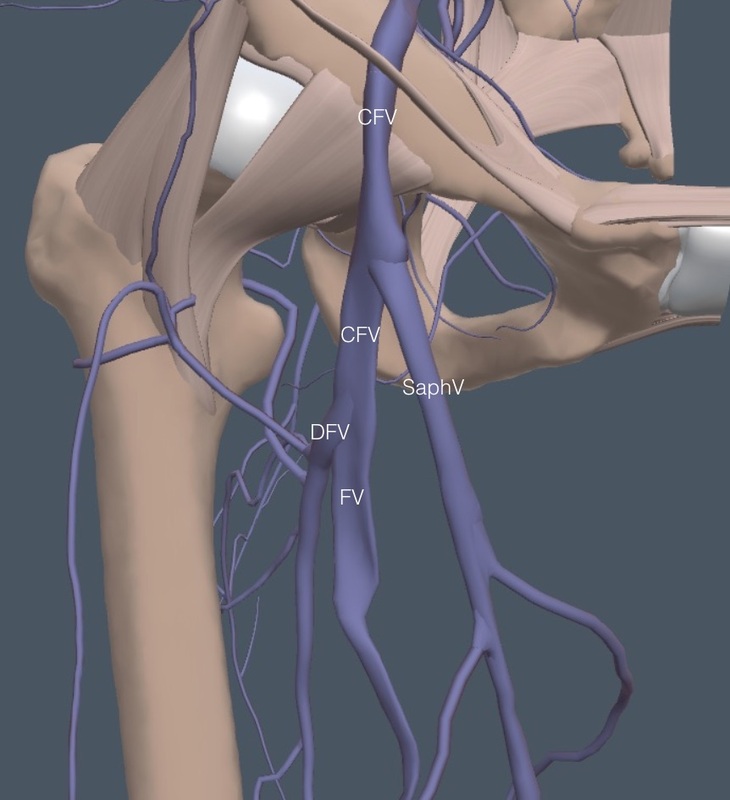 The ScV branches right before the axilla into the cephalic vein (CeV) and the axillary vein (AxV). The CeV climbs through the muscles to a superficial location and runs down the lateral surface of the arm. The CeV can develop a clot which can extend into the ScV, so it is good to see compression of the proximal CeV. Here is a clip following the distal ScV in transverse view as it branches into the CeV (the more anterior vessel) and the AxV. Both veins compress fully, leaving only the accompanying axillary artery visible. Here is another patient in whom the probe was rotated slightly to give a partially long axis view of the CeV running superiorly from the bifurcation. Both the CeV and AxV again collapsed. The CeV can be followed on the lateral arm if symptoms suggest thrombosis in that location. Use light probe pressure and generous gel in this location to see the proximal CeV. After the CeV takeoff, the remaining AxV enters the axilla and the following probe position gave a good transverse view of the vein in the patient. Here is a good sized AxV collapsing completely with modest pressure. 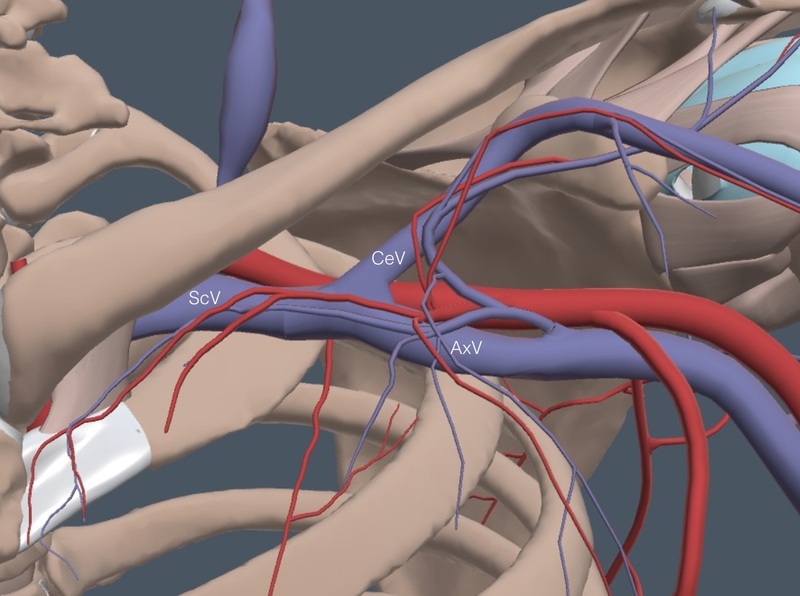 Continue to follow and compress the AxV down the medial arm and soon another branch point will appear where the AxV becomes the larger and more superficial basilic vein (BaV) and the smaller, deeper brachial vein (BrV). The BrV sometimes is duplicated. 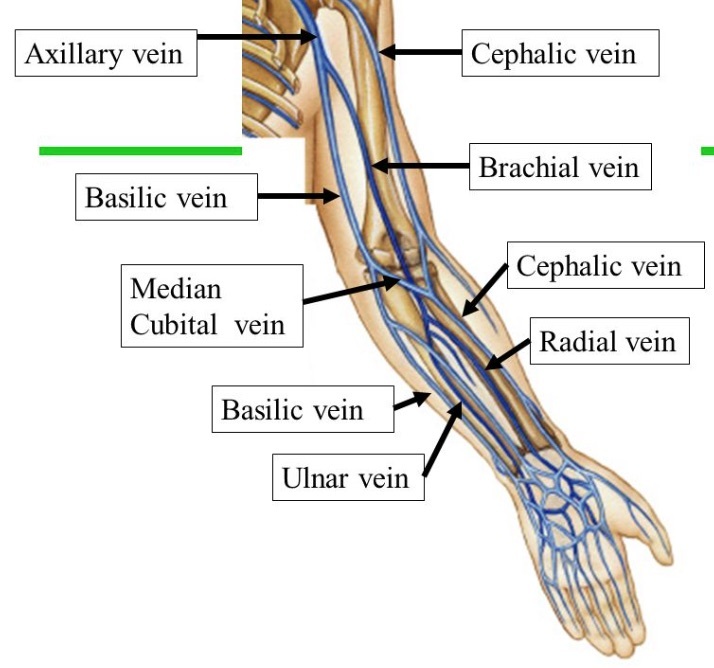 The following diagram depicts this branching and emphasizes that the largest veins below the AxV are the superficially located CeV and BaV, which continue through the lower arm. 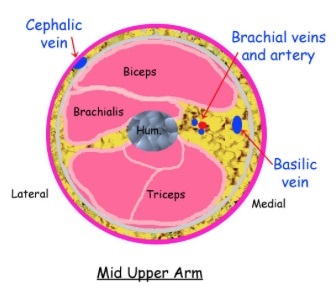 The smaller BrV runs deeper and close to the brachial artery and becomes the radial and ulnar veins at the elbow. All of these veins can thrombose. The following cross sectional drawing of the mid-upper left arm demonstrates the superficial location of the CeV on the lateral arm, the intermediate depth of the BaV on the medial arm, and the deeper location of the BrV (duplicated in this image). Here is the probe position where the AxV branched into the BaV and BrV in a patient. Here is the branching that was seen in the patient with the BaV more anterior and the BrV posterior and closer to the brachial artery. Both veins collapsed. The BaV remains larger and more superficial down to the elbow. In the following clip both the BaV and the BrV can be seen and both collapse normally. In this lean patient the veins are not far apart but they will be more separated in larger arms. STP occurs on the extremities and trunk (e.g. Mondor disease on the upper anterior chest). STP in several locations or recurrent suggests classic Trousseau syndrome of advanced cancer. However, most cases of STP are related to minor trauma or a complication in a varicose vein. STP involving varicosities appears to have less of a tendency to extend into the deep venous system. Leg STP is almost always in the distribution of the SaphV or the SSaphV, which are superficial veins. Treatment of isolated STP without accompanying DVT is usually symptomatic with an anti-inflammatory medication, although short term anticoagulation for particularly prominent and symptomatic disease is understandable. One published opinion is to anticoagulate STP that involves 5 cm or more of a vessel. STP is associated with DVT in a surprisingly high percentage of patients. While the deep veins in the region of the STP are logical sites for DVT, clots are sometimes found in the more proximal limb so looking at the whole limb is appropriate. Most surprisingly, DVT in a contralateral leg has been infrequently found associated with STP, but this really seems to suggest a Trousseau-type situation in malignancy. The IMBUS role is to confirm the presence of a non-collapsible superficial vein in the symptomatic site, define the length of the STP, AND confirm patency of the deep venous system in the involved limb. If DVT is present, most patients would be anticoagulated. If the DVT is quite distal and a patient is at higher risk for bleeding, followup IMBUS looking for DVT progression is reasonable. Here is a clinic patient with a large and tender varicosity on the anterior, lower leg. The vein contained hyperechoic material, was non-compressible, and had no color flow. The PopV region veins collapsed normally. The size of the STP would have argued for anticoagulation but the occurrence in a varicosity would have lowered the risk of progression to DVT. Thus, the anticoagulation decision would have depended on the bleeding risk in the particular patient.